I used to take it for granted that when I trained or worked really hard, my sleep would suffer. I was resigned to the fact that my sleep issues were a major limiter to my athletic, academic and professional potential. At its worst in my final year of undergrad, I was wide awake before 3:00 AM every morning, a sleep disorder known as early-morning awakening insomnia. I would doggedly train until sunrise, plow through six senior-level courses, drag myself through an afternoon workout and steal unsatisfying naps at every opportunity. During the crescendo of stress that accompanied exams, I tossed and turned in the evening as well, whittling away my night’s sleep at both ends. I felt like a complete lunatic. This pattern persisted with varying severity for years. For the most part, I tolerated it, clinging to the pipe dream that my sleep issues would magically disappear the day I graduated. But they didn’t. In December 2012 with a sleep deficit stretching before me like a yawning chasm, I finally resolved to get serious about sleep. In this two part post in my self-improvement series, I’m going to share the shotgun approach that got my sleep back on track. Since I tried many strategies at the same time, it’s nearly impossible to tease out causation from correlation. I’ll present everything I tried and highlight the strategies that I think were most helpful. Practicing good sleep hygiene involves controlling the mental and environmental factors that influence sleep. It should go without saying that serious athletes should take an interest in sleep hygiene. One of the most effective steps I took was to adopt a consistent bedtime routine that primes my mind and body for sleep. My routine starts after dinner. I try to avoid strenuous training sessions after 6:00 PM and I never train after 8:00 PM. From experience, I know that this can be problematic. I choose relaxing activities that wind down my thoughts, like reading, playing the piano or light yoga. I find that doing anything remotely productive after 8:00 PM has an adverse affect on my sleep, whether it’s work or even social media. Some people can work late and conk out immediately, but my brain takes a long time to log out of work mode. 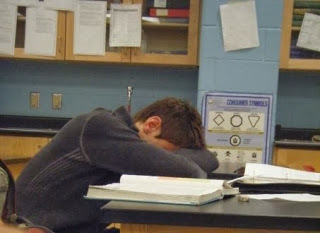 After the dreaded evening exams in university, I’d be wired into the wee hours of the morning! I also take a cue from vampires, masters of slumber capable of sleeping for millennia, by avoiding sources of bright light before bed. I try to stick to an 8:00 PM screen time curfew, which is doubly effective since computer-related activities are rarely relaxing. I also have a very dim bedside lamp for reading. Finally, maintaining a consistent bedtime has proved to be very important for me. I’m in bed before 10:00 PM every night. Even one late night can throw off my sleep cycle for days, which makes me cranky. Kind of pathetic for a 23 year-old! Yoga is a key part of my bedtime routine and deserves special mention. Information abounds on yoga as a cure for insomnia. I find that a quick yoga session before bed, often as little as 5-10 minutes, goes a long way towards counteracting a mentally and physically stressful day. 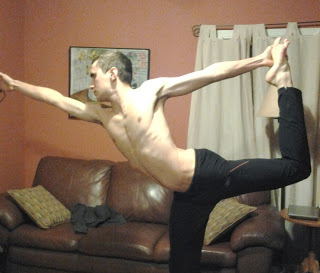 Balances and spinal twists are my favourite before bed. Triathletes aren’t known for their hip flexibility. Dude, where’s your yoga mat? Poor sleep and stress can form a positive feedback loop (aka a vicious cycle); the more unmanageable your workload, the more your sleep suffers, the more stressful the same workload becomes. This is true of both training stress and other sources of stress. I’m convinced that my insomnia was both a cause and symptom of an inappropriate training load. Introducing more recovery, on a day-to-day basis and on a larger scale over the course of a season, helped mitigate the negative effects of training on my sleep. The key wasn’t training less overall, but training really hard on some days and really easy on others with an appropriate balance given the training phase (read more: Microcycles, Macro Mistakes). Falling asleep and waking up at reasonable times are only half the battle. A million things can interrupt your sleep, especially if you are a light sleeper. A sleepmask, earplugs, heavy curtains and blinds are a must for recovering insomniacs or anyone who puts a premium on sleep. Darkness also triggers the production of melatonin, a hormone that regulates the sleep cycle (more on that in Part II). Ear plugs preserved my sanity (and felony-free record) in first year university when there was always a party raging in residence. The only downside to these sleep aids is that they are addictive! I buy construction-grade foam earplugs by the boatload on eBay. While I haven’t entirely banished clocks from my bedroom as some recommend, I avoid checking the time in the evening and especially when I wake up. This helps put you in touch with your true state of tiredness/restedness, as opposed to how you think you should feel based on the time. It also helps avoid sleep performance anxiety and a defeatist attitude: “OMG, it 2:30 AM and I’m still awake. I’m going to be a wreck tomorrow.” Obviously, this state of mind is not conducive to falling asleep. I take my naps very seriously. That said, naps should supplement your night’s sleep, not replace it. For over a year, I was heavily dependent on “segmented” or “bimodal” sleep, a sleep pattern involving two or more significant blocks of sleep every day. While you can certainly make this work, and some suggest that it’s the most natural pattern of sleep, it’s not very compatible with most work/school/social arrangements. It’s restrictive to plan every day around a second snooze and I often ended up short on sleep. I decided to wean myself off long naps, since I figured they were hurting my night’s sleep. This was a painful process and mostly a failure. The only thing that skipping naps accomplished was making me feel like crap most of the day. A more effective and realistic strategy for recovering insomniacs may be to nap as early as possible in the day, and never in the late afternoon. High school, c. 2006. Early stages of my napping addiction. While napping used to be a crutch to cope with insomnia, these days it’s a lifestyle choice. I still make a point of napping every day, not because I feel like a strung out crack addict if I don’t, but because napping improves every aspect of my life, from athletic performance to work productivity to mood. In Part II, I look at tracking sleep, light therapy, weight and melatonin supplementation. Do have any sleep tips to share? Let me know in the comments below, on Facebook or Twitter.